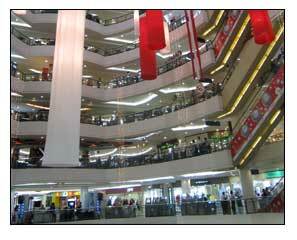 Tunjungan Plaza, located on the center of the city - Central Surabaya. It's modern shopping center, built in modern architecture. It has fasilities, eg : shopping center, restaurant, playing arena, beauty salon (barber shop), telecommunication shop, book store, super market, local snack, fast food, coffee shop, baguette, cinema, discotic, karaoke, show room, open stage, etc. It also has a wide parking area for any kinds of vehicles.